VW’s I.D. 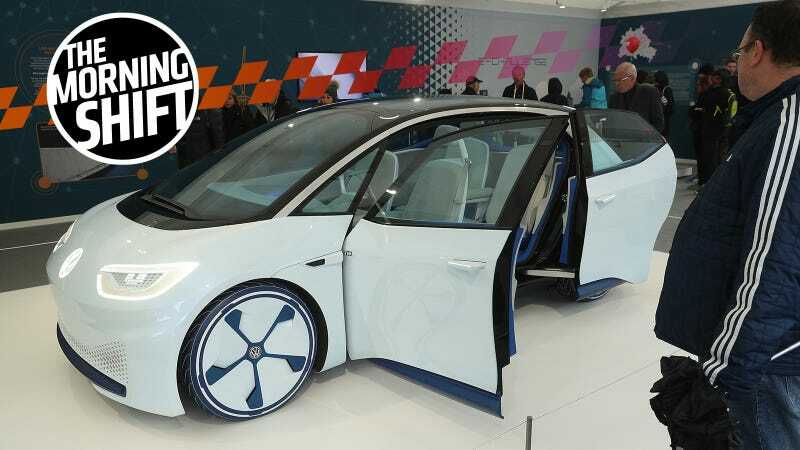 concept electric car, on display at recent Unity Day celebrations in Germany. Surprising (and bad) news for Jaguar Land Rover, the prospect of a Chinese-built Lexus, and so much more in The Morning Shift for Tuesday, Oct. 9, 2018. In a clash between concerns over the environmental risk of emissions and industry competitiveness, EU governments remained divided ahead of talks over what 2030 limits to impose on Europe’s powerful automakers. Germany, with its big auto sector, has backed the EU executives proposed target of a 30 percent reduction by 2030, compared to 2021 levels. France, Netherlands and a number of other countries, however, are pushing for a stricter limit of 40 percent, in line with higher climate targets backed by EU lawmakers last week. It’s easy to think of Germany as more environmentally conscious than America, more enlightened on that side. Certainly it’s easier to recycle over there and you get the feeling that people care more. But a lot of the time Germany just ends up putting its big auto industry first at the expense of everything else. Jaguar Land Rover will close its plant in Solihull, England, for two weeks after the company reported a nearly 50 percent fall in sales to China as import duties and a trade war with the U.S. hurt demand. China’s automobile sales have been falling in recent months, with a slowing economy and trade frictions making consumers cautious about spending, an industry body said last month. “As part of the company’s continued strategy for profitable growth, Jaguar Land Rover is focused on achieving operational efficiencies and will align supply to reflect fluctuating demand globally as required,” a JLR spokesman said in a statement. All of this puts global sales down by about 12.3 percent, as The Economic Times reports, and shares in Tata Motors have “plunged” more than 16 percent because of it. Reuters also notes that Jag sells a lot of diesels, the fate of which have been in jeopardy in Europe as of late. And Reuters also also notes that Brexit could further screw up the company. Toyota Motor Corp., long opposed to producing its premium Lexus cars in China because of concerns over quality and profitability, is now considering it to ignite growth and narrow sales gaps with its German rivals, four company insiders told Reuters. I’ve heard a few times that Toyota is a seriously conservative operation, and it’s interesting to see just how long it takes for things to come together with its prestige marque. The German automaker is in talks with Li’s Zhejiang Geely Holding Group in setting up a 50-50 joint venture to offer the services, said one of the people, who asked not to be named as the plan is private. The discussions haven’t been finalized, the people said. Spokesmen for Daimler and Geely declined to comment. Geely, it should be noted, reported double-digit growth last month, so it might just have the momentum to make all this work. I was not aware that David Beckham helped promote a Vietnamese car company run by a former General Motors lifer, that uses BMW platforms restyled by Pininfarina. Vietnam’s first domestic auto brand, VinFast, will name its first sedan the Lux A2.0 and first SUV the Lux SA2.0. Deliveries of the two models will start in Vietnam in June 2019, the company said, with exports starting in 2020. VinFast declined to identify any export markets. The cars are based on modified BMW platforms and are powered by BMW 2.0-liter turbocharged gasoline engines reworked for VinFast by Austrian engine specialist AVL. This will all be in addition to making rebadged GM city cars, spawning from an earlier deal to take over GM’s factory, dealer network, and employees of GM Vietnam. Production has not started yet on the new cars, but VinFast reportedly has several billion invested in the venture. Neutral: Which Car-Producing Country Is the Most Protectionist? I do wonder if I’m periodically too harsh on Germany. I know it can do better, is all. But I also wonder if there is a car-producing country that is even more protectionist than it is. Maybe we’re the worst?